Painless Eyebrow Transformations That Last Up To a Year! At Sian Dellar’s semi permanent makeup clinic in London we have developed a process that is totally individual and personalised to you. We want you to have the best brows you’ve always dreamed of and that are perfect for YOUR face. Every microblading eyebrow treatment we create for our clients in London is personalised. There is no one size fits all where brows are concerned. Do you like very defined brows or do you prefer something more subtle? A lot of our clients have overplucked eyebrows that in the past were the fashion and now want a fuller eyebrow. We can create subtle to defined and anything in between. 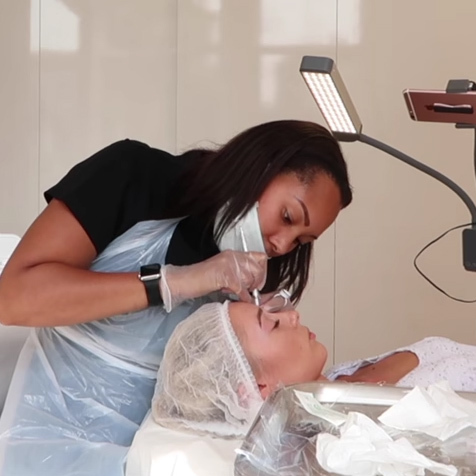 Our London based microblading consultation process helps us to determine what’s best for YOU. We would suggest bringing a photo of your ideal eyebrow or of yourself before over-tweezing so we can do our best to create it for you, but face shape, size and bone structure all play a part in our brow design so bare this in mind. This is also our time to be very realistic with you about what we can achieve. We never over-promise, but at the same time, we can achieve a lot! Once we determine the perfect, customised shape for you, we then draw it on using an eyebrow pencil so you get an idea of the shape and teh best colour of the enhancement before we start. Our goal is to create a beautiful eyebrow that matches the symmetry of your face and looks very natural. We’ll then have you make different facial expressions to make sure the brows look perfect laughing, smiling, eyes open or closed. A lot of clients ask, “Does it hurt?” The answer is: no, I would say more uncomfortable. Some clients describe the feeling as scratchy and others like slight pressure, some even fall asleep! A topical numbing cream is applied to the area prior to the treatment taking place to minimise any discomfort! Whatever the feeling, you leave the clinic with the most amazing eyebrows, so it’s all worth it in the end! With the anesthetic applied, we begin microblading! This takes around 30 minutes. Each individual hairstroke is drawn onto to skin by hand, matching the direction of your natural hair. The stokes are drawn to mimic actual hairs creating a 3D effect and ultra realist looking semi permanent makeup enhancement which we’re sure you will love! The whole process takes around an hour and a half so within no time at all we’ve completed your new eyebrows! Due to the contact with your skin, there can be some redness, but this subsides after a few hours and most clients leave free to continue their day as normal so no need to hide away. A complimentary follow up appointment in London is included with this treatment at around 4-6 weeks to finalise your enhancement and to make any final adjustments to the area. All that’s left is to enjoy your new eyebrows and say goodbye to the eyebrow pencils and drawing your eyebrows on in the morning because these new brows last up to a whole year! As our treatments are semi permanent, we advise regular maintenance treatments to keep the colour looking fresh. Time between top ups vary for each client but annually is best!